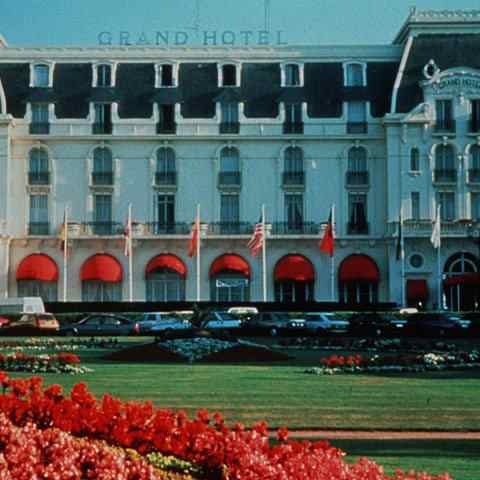 On the seaside, next to the casino and the Marcel Proust promenade, the Grand Hôtel, built in 1907, gives the small town of Cabourg an air of elegance and simplicity that is still appreciated today. A small paradise for gala evenings in an entirely renovated setting. Cabourg is the last resort on the Côte Fleurie before entering the region of the Côte de Nacre. All renovated, rooms are comfortable, spacious and functional. Television (local channels, CNN, Sky News, Eurosport, pay TV, satellite), radio, wake-up, direct-dial telephone. Some with terraces facing the sea. Suites for luxury stays. Piano bar on Saturday evening, tea room, brunch, dinner-show. Jogging, beach in front of the hotel, parlour games. Entertainment on request. Nearby : Casino, sports competition, motor sports, 20 tennis courts, indoor swimming pool, minigolf, garden, sailing, windsurfing, speed sail, jogging, horseriding, ATB, karting. 9- and 18-hole golf courses (with introduction). Automobile circuit, tourist and cultural circuits. Places to visit : Created during the Second Empire, the small town of Cabourg is a pleasant place for taking a stroll. From the Côte Fleurie to Honfleur. The Peace Memorial at Caen. 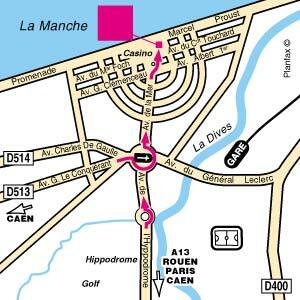 Station : Deauville (20 km), Caen (23 km), Dives/Cabourg on week-ends (2 km). Airport : Caen-Carpiquet (25 km), Deauville-Saint-Gatien. Road : 2 h from Paris via the A 13 (Dozule exit n°29) and N 13.